An ESPN Outdoors article by James Swan on fishing the Bay Area’s piers, August 17, 2009. www.jamesswan.com. There’s something fishy going on out there — according to the Congressional Sportsmen’s Foundation. California has more sport fishermen than any other state — 2.4 million anglers. The USFWS, however, says that there were 1,578,000 million California resident anglers and 152,000 nonresidents in 2006. They spent an average 11 days a year in piscatorial pursuits and collectively pumped $2,420,503,000 bucks into the state economy. That’s no sardines, folks. Okay, so how do you explain the discrepancy of nearly 900,000 anglers between the two sources? Kids under 16 don’t need a license. In the Golden State, folks over 65 who don’t make much annual income and people active in the military can get a reduced cost license, but no freebies. Other than kids, the only others who are exempt are handicapped people who get to fish everywhere for free. Those groups together account for maybe a third to a half of the total. 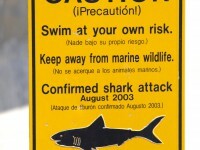 You can find them on California’s public piers and jetties in San Francisco Bay and other harbors, and even out into the Pacific, all along the coast. 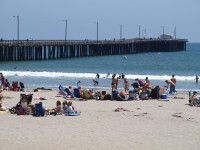 There are over 50 major public piers and jetties to choose from in California. Fishing there does not require a license, although anglers still have to abide by all laws. 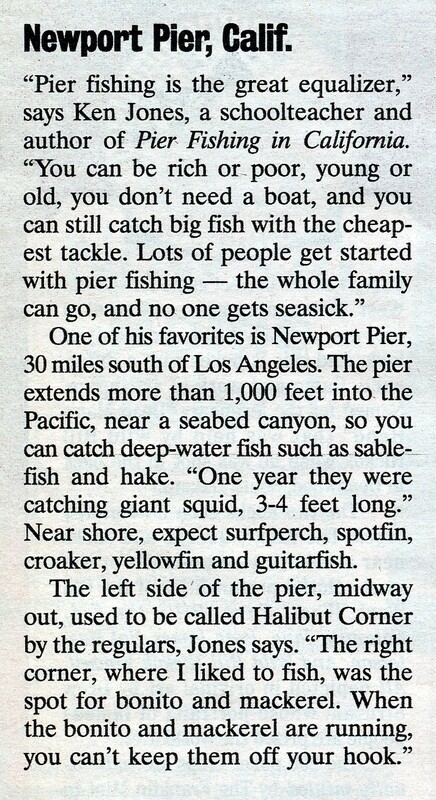 California public pier fishing allows you 2 poles, three hooks each, or one pole and crab trap, or two crab traps. And these days, with the economy going through some rough water, California’s piers are bustling with anglers – some just cooling their heels, others taking home some fresh protein. 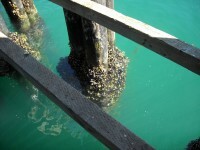 Around San Francisco Bay, we have a number of extremely popular fishing piers. On either side of the Golden Gate Bridge, there are fishing piers that draw upwards of 100 anglers or more at a time. When I went down to the Fort Baker Pier on the north side of the bridge the other day to escape from the phone and the internet, I passed a family leaving with half a 5 gallon pail filled jacksmelt – a slender silverside fish that can get to 18 inches in length. Jacksmelt are tasty, except for having a lot of small bones. In Japantown, you will pay almost $3.00 a pound for jacksmelt, so that family went home with $50.00 worth of fresh fish that they caught in 3 hours or less with small pieces of shrimp costing maybe $2.00. When the jacksmelt are running you frequently will haul in 2 or 3 fish at a time. 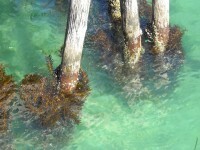 In the winter, herring, sardines and anchovies also swarm under the pier. Several other people had pails nearly filled with red rock crabs, smaller than Dungeness, which are illegal to catch in San Francisco Bay, but just as tasty. Limit on rock crabs is 35 a day, 4” across the back or larger. Crab anglers use hoop ring nets, traps, and even a gizmo that looks like an open sardine can filled with bait and caught up in a nightmare snarl of monofilament. You cast it out with a rod and reel. When a crab goes after the bait, it gets tangled in the monofilament, and hangs on when you reel it in. Looks ugly, but it’s really effective for getting out at the crabs beyond the reach of the pier netters. “If you are going to fish for crabs, you have to put your bait in a cage,” one angler told me, “because the sea lions will steal it.” Chicken legs and backs, anglers agree, seem to be the best bait for crabs. Admittedly there are other piers that are better for bigger fish, but if you want view – you are almost under the Golden gate Bridge and looking toward Alcatraz Island and San Francisco – the Ft. Baker Pier is hard to beat. On the south side of the Golden Gate, Fort Point Pier has an equally good view of the bridge, but you are looking north at the tawny brown hills of the Marin Headlands. Fort Point Pier and the San Francisco Municipal Pier a couple miles east beside Fisherman’s Wharf, have all the small fish found across the strait, as well as crabs, white croakers, sharks, halibut and an occasional salmon when the tide is right. Most people say that an incoming tide is best. To the east across San Francisco Bay, the 3000 feet-long Berkeley Pier, a former car ferry pier that was abandoned 60 years ago when the Bay Bridge was completed, is almost always crowded. 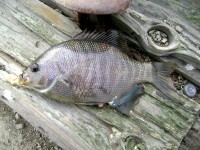 Several species of perch and jacksmelt are found around the pilings. Striped bass pass through in schools and flounder fishing is good in the winter. Occasionally someone hooks a bat ray or a sturgeon off the Berkeley Pier and then all hell breaks open as they race along trying to keep up with an underwater freight train. 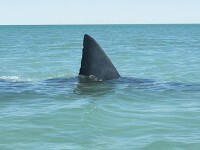 Landing a big fish off a pier is challenging. You can try to walk them up to the beach and beach them, but most people use a crab ring net lowered down from the pier. But the real attraction here is when the Pacific halibut are in, which has been the case for the last two years. Pacific halibut normally get up to 25 pounds, and the Berkeley pier is one of the best and most consistent places in the state to catch halibut from shore or a pier. Live bait is the ticket for halibut. The real pier par excellence in the Bay area, however, is the L-shaped 1000’ Pacifica Pier, located just a few miles south of San Francisco on the ocean, at Pacifica. 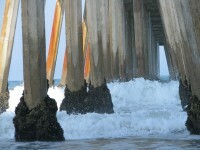 This is generally considered to be the premiere fishing pier in the state, perhaps on the entire West Coast. 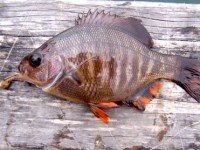 Surf Perch, half a dozen other species of perch, smelt, tomcod, sculpins, sand dabs, flounder and stripers are the normal fare. It’s not unusual to come home with a couple dozen fish. However, the real specialty at the Pacifica Pier is Chinook salmon. Starting in the l980’s the big fish began to school along the shore in the late summer and passed right under the pier in swarms before heading under the Golden gate Bridge. Before the salmon runs crashed in 2007, there were days where upwards of 1000 salmon were taken in single day off the Pacifica Pier. There have not been many salmon seen around the Pacific Pier this summer, but in July for about a week, there was a female humpback whale and her calf that frolicked in the surf with in 100 yards of the pier and the beach. Folks are so serious about pier fishing out here that they have even formed an organization United Pier and Shore Anglers of California. 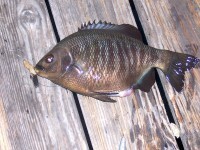 Pier fishing is cheap, fun, and rewarding. That’s what recreation is all about, especially when the economy is as rough as the waves crashing in around the Pacifica Pier when there’s a strong onshore breeze. 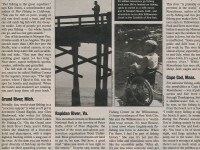 And if you want the bible for pier fishing in California, it’s Ken Jones’ Pier Fishing In California.